I worked with Michael Robertson for seven years and watched first hand his methods. Anyone who follows my blog knows I wasn't impressed with his ethics or tactics. If you want to see a typical example of how Robertson tries to fool people to get his way by misrepresenting the facts (like when he falsely charged former employees for embezzlement to get money from his bank), look at his latest blog where he puts down the successful music service Lala. The REAL reason Robertson dislikes Lala. To me, this seems to be Robertson's typical cycle: start a business, fail, then start tossing garbage at the companies who did it right and succeeded, thereby justifying his failure. Linspire lost to Red Hat, Novell and Canonical (Ubuntu). MP3tunes lost to Lala. SipPhone lost to Skype. And so it goes, leaving Robertson with plenty of companies to whine about. First he starts off like a politician, by trying to scare you with some horrible, over-the-top threat that only he can protect you from: "An insidious new plot to wrestle control of your personal music library is underway." He then goes on to compare it to a "roach motel." Ohhhh, the drama! Whatever shall we do?!? Please Michael, save us from this "insidious new plot!" Robertson talks about how Lala must be evil because it has taken investment from music companies. I have absolutely no idea if that's true or not (as I don't believe anything that comes from of Robertson), but what I DO know is that when I was CEO of Linspire, Robertson was more than happy to have Linspire take millions of dollars from "the evil" Microsoft and partner with them. So I guess Microsoft was pulling all of Michael's strings at Linspire? Robertson put millions in his own pocket that came directly from Microsoft ($3M while I was CEO, and I'm sure more after I left). The money that flowed from Microsoft to Robertson more than likely helped fund MP3tunes. So, using Michael's logic, we can all assume that Microsoft is pulling the strings at MP3tunes, right? Such hypocrisy. The only reason MP3tunes isn't backed by "big music," is because big music is smarter than that. Warner Music tried one time to partner with Robertson and got stabbed in the back the second the ink was dry on the agreement. If one of the big record labels offered to put money into MP3tunes, Robertson would take it in a minute, just like he did at Linspire with the Microsoft deal. Robertson's claim that he will never "sell out the consumer," is utter rubbish. As CEO at Linspire, I didn't see him raise one objection to Linspire's "deal with the devil" Microsoft, or him concerned in the least about how this would affect the consumer. All I saw him care about was how big was the check and him making sure that $3M was wired to his personal account on the very day we got paid from Microsoft to cover a line of credit Linspire had with Robertson. Many times I watched Robertson intentionally do things that would annoy our users because it would sell more product. As soon as I became CEO, I made CNR free and put out a free version of Linspire (Freespire), all going against what Roberson did as CEO. Robertson helped to justify Microsoft's patent claims when Linspire entered into their deal with Microsoft, so his claims of being the champion against patents, DRM, and protecting consumers' rights rings hollow. I only thing I saw Robertson ever care about was himself, his ego and his net worth. Robertson is the one person I know who can make the big record labels seem like good, honest, honorable people. Next comes more lies and half truths. He says, "To participate you just need to upload all the tracks from your personal library." Lala should sue Robertson for that line, because it's total rubbish. You don't have to upload a single song from your library to participate at LaLa, but by lying about this, Robertson can make Lala seem so much more "insidious," so why let the truth get in the way? Robertson's nonsense continues with, "Your music will be controlled by Lala and will eventually vanish, because no company lasts forever." There is no truth to the first part, and the second part would apply even more so to Robertson's companies, given their poor performance. Robertson then offers a table where he laughably labels LaLa as the "Record Label Locker," and MP3tunes the "Consumer Locker." Robertson insults the reader with this transparent "BS." Lala is an independent music service, even though Robertson wants to scare you into believing otherwise. Read what Ed Bott has to say about Lala on ZDnet. From what I hear, all the best employees have left MP3tunes and there are hardly any employees even left there. Why would anyone want to waste their time uploading their music to a business that will probably go the way of MP3.com, Linspire, AJAX Windows, and so many other ventures started by Robertson? I've had years of watching Robertson closely. I wouldn't trust anything he says. If you want to have a great selection of music that you can buy in non-DRM MP3s, I'd ignore Robertson and check out Lala. You'll see why it's succeeding. Also, saying that he's protecting the consumer and making the record company evil is actually pretty offensive. Many people are like me in that we want to support artists and will gladly play nice with the music companies. Its not me against the music industry. I'm not sure how Lala does the locker. I never use it for that. I just use it to buy MP3 files for cheap. If they do do it that way, then that's even better because you don't have to wait for it to upload (like you do with MP3tunes). This is how Robertson tried to do at MP3.com (with My.MP3.com) but because he didn't have permission, he violated copyright law and destroyed MP3.com's value for shareholders in the process. You can buy a 1 Terabyte external hard drive at Costco for around $100. Sounds like a more convenient way to back up music to me than a locker, then just sync it to your phone. Done. Exactly Karla. Robertson acts like all record labels are evil and he's somehow music's savior. When I started MP3tunes when it was part of Linspire, the goal was to provide an avenue for artists to sell their music to Linux users. Robertson killed that, pushed all the indie music in the background, and did this silly locker thing which in turn will kill MP3tunes with a) dumb ideas, and b) lawsuits. I've seen how Robertson treats people. He has no room to be calling anyone evil. I used mp3tunes up until it expired last month but have also been using lala for about 6 months now and I actually love it. lala is a fantastic service. Great prices, no drm, huge selection. mp3tunes isn't even close by comparison. I agree, this is just Michael complaining because lala is eating his lunch. It seems that MR discounts every idea that doesn't originate with him. Here, it seems, is another example. Lala seems to have a better business model & plan than MP3Tunes.com and it's costing MR money & customers. Since it's better than his product, MR is taking shots at it instead of expending the time and resources his improve his own product. It's very sad from someone who, when Lindows.com was in it's infancy, screamed, 'fowl,' when Microsoft came after the company and MR was had the, 'competition is good,' line. 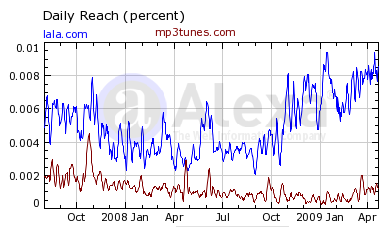 Well, Lala is competing with MP3Tunes.com, and apparently doing a good job. MR has a lot of nerve to attack a valid competitor considering his prior articles & comments about how competition is good. It seems it's okay for HIM to compete with others, but not the other way around. Regards, Kevin and thanks for posting! Yes, the hypocrisy is the worst part, and how he misrepresents things to try to fool people. lala is awesome. Robertson is just jealous. He hasn't had a good idea in years. Well said Brian. It would be funny if it weren't so true. For pay service: Pay money for crippled files. BitTorrent Service: Free files that work anywhere, no questions. Guess which ones Ill be taking, artists be damned. Hey, is that you Michael? Artists and copyright law "be damned." Sure sounds like him. And secondly, this is capitalism. Pirates provide better product at 0 price. The only way to win against that while charging is to provide the same quality of media conveniently. Convenient? Yeah. "If you buy from Big5MusicService, we'll give you a program to scan your collection. We'll then fix your tags and organize your collection depending how you want it." Instead, they (and you) wish to wrap music and movies in yet another wrapper of DRM. And did Michael blow it out of proportion? Probably. But is there drm in any capacity Yes. Hence worse quality than pirates' media. That's the reason why I pirate. Better quality and files that work anywhere. Buying wastes my money on files that are restricted and may even not work sometime in the future. You clearly haven't followed my career. (I was and remain in the music industry and I have never released one single song with DRM, nor would I ever.) I think DRM is a BAD idea for labels to use, BUT I defend their right to do it if they want, because it's THEIR content, not yours. THEY get to set the rules, not you or Robertson. Just because I disagree with DRM doesn't mean I get to steal copyrighted content. Suppose you had a shoe store and sold your shoes for $50, and I felt that was too much or unfair. Would you be OK if I just stole the shoes from you? Pirates are thieves, pure and simple. You're no better than someone who robs a bank or shop lifts. You're taking something that isn't yours. Period. Lala sells MP3's without DRM. That was my point about Robertson's typical over hype. He's no better than the worst crooks I've ever met. Artists get to decide how they want to distribute their music, not you. Just because I think labels are dumb for using DRM, I don't condone theft. You and MR clearly do. Kevin, I agree with you that pirating music, software, movies, etc is wrong. I personally do not have pirated music, software, movies, or anything else in my household. Of course that means I only have what I can afford and maybe not the newest and coolest stuff. That said, the theft argument needs to go away. It is copyright infringement not theft. Theft is stealing a car or someone's diamond ring. It involves a physical item that is finite and can only exist in one place at a time. The term is inaccurately used by businesses selling easily duplicated products to try to prove they lost money on something that is non-tangible and potentially infinite. The BSA does it all the time with their statistics about money lost to software piracy. An instance of copyright infringement - music, software, movies, or otherwise does not indicate a lost sale. It is entirely possible the person would not have it if the only way to get it was to pay for it. 100 infringements is not necessarily 100 lost sales. It is certainly likely some of those are lost sales but no one can accurately quantify the loss so it is merely inflated and deflated numbers to support the case of the individuals discussing it. It still is not theft which is not saying that it is the right thing to do but rather we should approach it as the crime that it is and not the crime we would like it to be. Back to the real subject. Thanks for the write up on Lala. It's good to see an unbiased opinion of the service. You can define it like you wish, but the way I was raised, if you take something that isn't yours, it's "stealing." Plane and simple. It's how I was raised, and how I raised my children. The reality is I didn't define it. The judicial system did. Regarding your statement about not stealing and raising children not to steal - I don't think it is unreasonable to assume that is the position of the majority of the population. You might be teetering over the edge of self-righteousness pointing that one out. :-) Please don't take offense. None is intended. You're right. I have no clue of your career. Your blog, to me, was just a link from slashdot.org . However, I know what the "Media Industry" has done to me. On the music side, they have ignored red book standards and made ripping content I paid for a severe pain. When they aren't doing that, companies like Sony install rootkits to 'prevent unauthorized copying'. Oh, and there was that promise that cd audio prices would fall considerably once CD audio took hold. Guess what? They lied. We also have nasty games on the movie side as well. We've dealt with the headache called Macrovision since it came out. VHS tapes wear out so we used our fair use to copy what we bought... well, not until we bought an early VHS that didn't have an AGC. These games of 'Cant Play here' still go to this day. I bought some England DVDs (key word: bought) and brought them back to the states. DVD player says NUH HUH. So, instead, I play then using that illegal movie tool VLC to play movies that I bought. So tell me: is CSS aimed at preventing copying (which it doesnt) or milking an international market. I was trying to be a decent customer and awarding the makers, but they screwed me over unless I break the law. Now the main crux: do artists deserve money for works enjoyed? I think so. However, do artists own me because I liked their work? Nope. By default, even my post is under a copyright of something like 150 years. That's insane. And that number keeps climbing. And then we have the "technological measures" to control the users who buy our work. Oh, but we're allowed to back up as that's Fair Use. Buy damn you for trying under the DMCA. The pendulum has swung far to one side. It's high time for it to come back. Now, you'll probably respond (as do most people) something along the lines "Why dont you get the laws changed". The simple answer is that we're not represented. Those that treat us with respect and dignity will be treated themselves with respect and dignity. I'm thinking of along the lines of Baen, as they give away works all the time, but still have plenty of customers. Those that do not treat *people who would be willing to buy works* with no respect and denigrate them as thieves should expect no less.